What’s there for the Kids and Families? A fun-day out with the family is so important and therapeutic today and we are acutely aware that Mums and Dads are very selective with their down-time choices. Families work hard, endure difficulties and challenges – perhaps different to what medieval families had to endure – but nonetheless – both visible and invisible trials are surmounted each day by children and their families. So kicking back and bonding with the members of your inner circle is very important. To include learning and fun is a must-do – from our perspective – and we hope that this year you’ll see that kids are the winners! The festival interweaves very unique opportunities for families to come together, wind-down and indulge in vivid and colourful imagination . This is just what kids love and want and as adults, this is where we can really learn from our kids – fun is therapy. It makes us feel better. No explanations necessary. We promise you, there’s fun to be had at this festival. So what do we have in store for your children this year? Kids of all ages will clap, cheer, and laugh themselves silly when Domino the Jester takes the stage. Get ready for fantastic feats of juggling, brilliant balancing and mystifying magic. Josh Croall – Juggler Extraordinaire – will be doing two demonstrations at the start and end of children’s entertainment block at the Pageant Wagon. Also at the Pageant Wagon, the Abbey House Troupe will tell stories of medieval legends for children. Led by a narrator, the troupe will act out scenes from King Arthur, Robin Hood and St. George and the Dragon. If you have ever wondered how a turban is tied, this is your chance to find out. Karvan-Saray, a 15th Century Syrian group, will show you how to keep the sun off your head – Bedouin style- exactly how the desert dwellers of the Middle East have been doing with ease for centuries. You can find this taking place at the Village Green, 11.00 Saturday and 1.00pm Sunday. Karvan Saray will also be holding a Drum Basics workshop from 1.00 – 1.30 in their encampment. 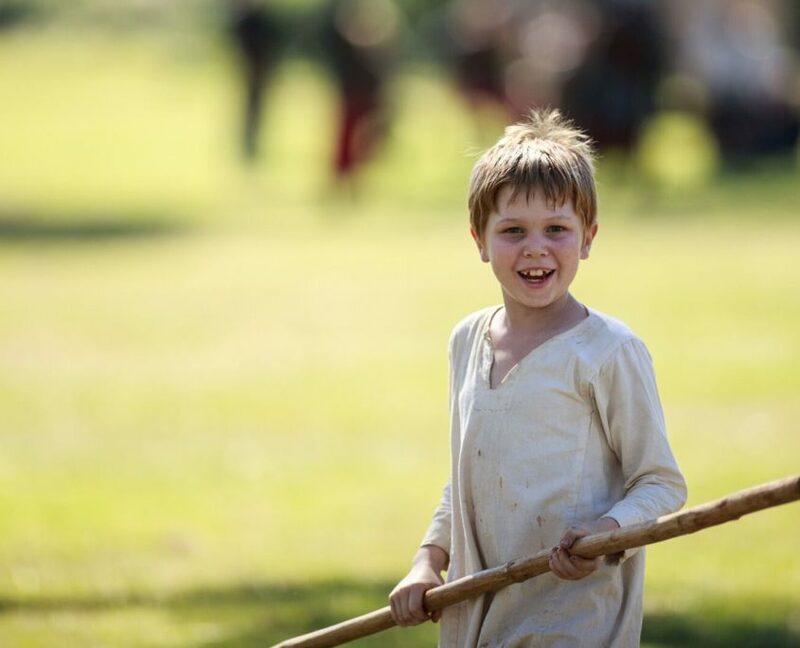 The Norviks – a Viking group – can show you how Viking children used to amuse themselves, demonstrating a range of Viking games and a boat-talk if you’d like to find out about ‘Fafnir’. For the older kids, those interested in the evolution of medieval garb, why not take a tour through the transition of fashion from early period through to the late medieval period as models display the evolution of clothing influenced by construction techniques, politics and status. They will never complain about their school uniform again! And the most hilarious of all, the Gurning competition, celebrating funny faces and all things silly. Make your way to the Friar’s Folly tavern at 1.30 -2.00 to face-off in making faces! Additionally, there are camel rides, a very exciting puppet show, and…..you’ll find a viking toy-shop presented by children for children in the Traders of Frojel encampment. So, we think you will agree, the kids will have no problems finding their favourite entertainment at this year’s festival. Kids Dig It!Medieval Family Fun WEEK! This is where the fun gets serious! A week-long of children’s activities themed on medieval daily life takes place from 2-6th July at the Abbey Museum. 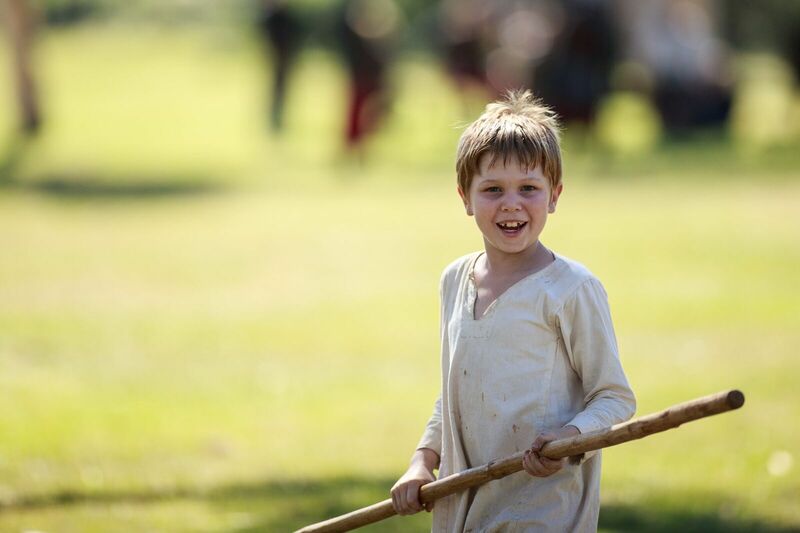 You could travel back in time somehow for these experiences, or you could just come to Caboolture’s award winning Abbey Museum of Art and Archaeology to join in all-day activities including the Abbey signature events – the Archaeological Digs and Archery. New this year will be Make a Poppet, Page training and for two mornings you’ll have the chance to take part in Archery Skirmish. You will also find medieval combat, needlework and illuminating letters masterclasses and there’s a costume competition with a prize each day! And if all this is too much, parents can hang out at the Abbey Cafe. Abbey Medieval Travel Package…in one’s face! Huzzar! to have so many people interested in the Abbey Medieval Travel Package, we are receiving lots of great feedback. What better experience to look forward to than a short holiday in SE Queensland this winter with your family. To help you enjoy this experience to its optimum, the Abbey Medieval Travel package is designed to take the hard work out of the planning, leaving you for more time to think about the important things like costumes and food and fun and….perhaps camel rides! And we have purposely excluded flights, simply because it is so easy for people to book their own preferences online. And besides, this is a perfect opportunity to use up those flight gift vouchers you received for Christmas or all those Frequent Flyer points that have been accumulating. The package includes a fantastic range of room types to suit all budgets with our two accommodation partners, Mon Komo and Gordon Motor inn. It also includes weekend pass to the festival with return transfers from and to your accommodation and airport return transfers. So all you really have to do is ask! Find out more now and make haste to save disappointment as the package closes on May 5th! And don’t forget to add Medieval Festival and Uplift Tours and Travel to your contact list or those emails containing information that you have requested may end up there! This week we were unfortunately faced with the difficult decision of cancelling our Kids’ Medieval Fun Day. We know that there are many fans out there who, like us, were disappointed with this situation; we want to thank you all for your understanding and support. We know there are many dedicated parents out there who worked hard creating costumes for little Knights and Princesses to attend the Kids’ Medieval Fun Day. So after a little shuffling around, we are happy to announce that we will have a Children’s Costume Competition this weekend at the Abbey Medieval Festival! Any young Lords and Ladies between the ages of 3 – 12 are welcome to participate in the competition which will be held on stage outside the Friar’s Folly at 12.45 – 1.15pm, We ask that those interested in participating please contact performance@abbeytournament.com. And parents, don’t miss out on a great offer from Medieval Fightclub! Present your Medieval Fightclub sponsored jousting ticket when purchasing a Toy Sword & Shield Set and they will give you another set FREE! You can find their stall in the market place all weekend. The Abbey Medieval Festival has an awesome surprise for you if you are travelling interstate or internationally during the upcoming school holidays! As part of our strategy to expand markets, both within Australia and overseas, from the 1st of June to the first week of July, tickets to the Abbey Medieval Festival will be available for sale at the international terminal of Brisbane Airport! Look for our huge banner and posters that feature the Hero image of the Abbey Medieval Festival! Airport staff and ambassadors for the Abbey Museum will also be sporting Abbey Medieval Festival t-shirts and are happy to pass on information about the Festival! So stop for a moment, buy a ticket, bring your friends and family and travel back to a time gone but not forgotton. Press a mental pause on the trains, planes and automobiles and transform yourself physically and mentally to a life that your ancesters might have experienced. The Abbey Medieval Festival is held on the 6th and 7th of July and the festival is your ticket to time travel. This celebration is the biggest and most authentic medieval showcase in the southern hemisphere and we are so fortunate to have it on our doorstep in Queensland! Normally, you might have to travel to Europe to see a spectacular as good as this one and this year is no exception! It’s getting bigger and better than ever before! And having tickets at the airport makes it one step easier for you. Fill your weekend with enthrallig displays from musicians, dancers and street performers from across Australia and overseas, experience battle re-enactment, jousting, archery, Turkish oil-wrestling, gypsy dance, arts and crafts, authentic medieval delicacies and so much more! There is so much to see and do! You will wish the festival ran for months!! For more information please call the Abbey Museum of Art and Archaeology on 5495 1652, or visit our webpage at www.abbeytournament.com. The figure of the Green Man appears to have it’s roots in carvings from the Messapotamic and Roman eras, but has also been seen in temples in India, Borneo and Nepal. He was used to bridge the gap between the old forms of worship and the new introduction of Christianity in the early Medieval period, although his appearances during this time were few. Have Abbey Medieval Festival Package….will travel! It has been a while since I last posted on this page and I am currently working on the perfect excuse to contact you all again. Today I’m going to give you a fantastic reason to visit Brisbane this winter. Today I’m going to tell you all about the ‘Abbey Medieval Festival Travel Package’! We had a lot of feed back last year that people found it hard to get to regional Brisbane festivals and in particular to our corner of the world for the Abbey Medieval Festival Your travel arrangements were complicated and you found it difficult to find a place to stay…… simply put..you needed some help! And yes we recognise while its wonderful to have a medieval festival like this with more than 37,000 visitors, the logistics involved for our visitors were challenging. So this year, we have the perfect solution for you! The Abbey Medieval Festival has teamed up with a number of partners to bring you ‘The Abbey Medieval Festival Package’. Three clicks and your travel is sorted! This package is like a pilll to take away your travel pain! Flights, accommodation, breakfast, transfers to and from the airport and transfers to and from the festival, all sorted! You will see also that the landing page features our two Accommodation Partners. We present the RendezVous Hotel and Suites and the Econolodge, both based in Brisbane CBD. These properties are great value and have a great range of rooms and suites allocated for visitors to the Abbey Medieval Festival. Just pick your choice, and Uplift Tours and Travel will arrange the rest. So this is a perfect solution for all those Abbey Medieval Festival visiting families and traveling groups out there to make life easier. Give us your travelling challenges and we will make it happen for you! We look forward to your feedback and we especially look forward to hearing about your travel experience – we know you are going to love this! Watch out for our posts on Facebook and Twitter! Today in my blog post I want to talk about connecting with the special people in your life and how important those experiences and memories are to us. I had a great week this week! I re-found two special people in my life that due to geography and being neglectful, I had lost connection with. It’s only afterwards that you realise how much you have missed out. And as soon as you hear that person’s voice again, the connection is instant and the time lapse dissappears. And thanks to Facebook and technology, we are in touch again. What a special feeling. Very often people drop in and out of our lives and sometimes we are left wondering why this person appeared and disappeared. Sometimes, it takes a special occasion to nurture those people that mean so much to you but you don’t see that often. You cannot wonder, then, why we are so happy here in the festival marketing team to learn that more and more of our visitors use the Abbey Medieval Festival and the Kids’ Medieval Fun Day as their occasion to reconnect and spend time with the special people in their lives. Thank you to all of those fabulous ‘connectors’ who do a much better job than I do and proactively look after the special relationships in their lives. We are so honoured that you are choosing the Abbey Medieval Festival as your venue for reunion. What a compliment! And because we know how difficult it is to organise friends and relatives who are interstate, we wanted to try and help out! Have you heard about our competition? Just click here and complete your details and you are in the running for a great prize worth $3,000. The prize consists of flights for a family of four from either Sydney or Melbourne, a car to get around, a week’s accommodation in the luxurious Novotel Twin Waters in the Sunshine Coast, VIP tickets for the Abbey Medieval Festival and to top it off – three more fantastic Queensland experiences – free family passes for Australia Zoo, Aussie World and Bellingham Maze. This is our way of helping all those connectors out there because we know it takes a lot of time and effort to make these occasions happen. So if you are in Queensland trying your best to get interstate family and friends together this July holidays, tell them about this competition! Don’t miss out on those special memories and experiences. Blog time again and what a busy week we have had! A bigger than expected response to our ads in New South Wales and Victoria, has left us in awe of our followers there. How happy are we to know you are out there! Thank you! In the competition last week, we asked our followers to complete a sentence about an experience they wish to fulfill at the Medieval Festival this year. It is always so interesting and sometimes unpredictable to hear what people say, and as the person whose job it is to look after those experiences…..it’s really my thing!!! (or how’s this one) and medieval religious ceremony! Or….. to simply just being there! We know that each one is important and actually quite personal and by getting it right we are honoured to be part of creating lasting and enjoyable memories for you and your loved ones. And we acknowledge that! But let me just add, however, by part-creation of these personal memories, the other part is up to you! And we SO want to present the right environment …the correct mix and match of medieval factors….that will inspire the exact level of engagement that you wish to contribute to this year’s festival and ultimately support your experiences. (Shh! Secretly what we want is to help enable a little…. but very personal…. medieval transformation to go on in your head; for you to leave this century and go back in time…..but more about that in a later blog). In other words, just get in there and see what happens! So let me pick one! The one experience that is proving extremely popular is the Fashion Trail! Ok, so this one is probably more for the Gals! Anyway, we are in the process of inviting some guest bloggers (of fashionable interest) to tell us about their fashion journey, but in the mean-time, please, I want to know about yours! I mentioned my own fashion story briefly in my first blog. And I’m pleased to say the project is making steady progress. A pattern has been agreed, and fabric and colours have been negotiated. Measurements are being taken …(and re-taken, I think for my own sake I want to wait until my steak dinner has settled)…and it’s all happening. Carolyn in Stanhope Gardens……let’s hear from you too! So I’m thinking the fashion this year is going to ROCK! Brisbane Fashion Festival and Teenvogue are you listening? I’d like to see some medieval gear on the cat walk…wouldn’t you readers? ?